An ordinary, highly perverted high-school boy who tries to live his life as peacefully as possible, with his personal motto "Peace and quiet is the best". Since his childhood he's been having a dream of an angel, which he wakes up from crying. At first he is repulsed by the appearance of Ikaros as he sees her wings, but he soon gets used to this, although he has no sexual attraction to Angeloids until he meets Delta. At first, when he sees Ikaros fall from the sky, and fall down in a hole, he looks at her, and runs away, because she was just asking for trouble, and she would just disrupt his "peace of quiet", but runs back to save her, though he gets saved himself by Ikaros. At the end of episode 9 of 1st season of Sora no Otoshimono (Sora no Otoshimono), Ikaros kisses him. 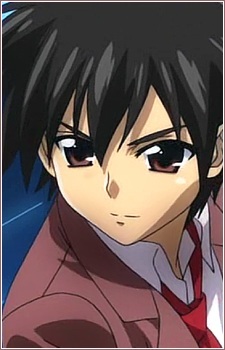 At the end of 2nd season of Sora no Otoshimono ( Sora no Otoshimono: Forte ), he almost gets married to Ikaros, after she mistakes what Tomoki wanted to say by saying " We'll stay together forever" as a proposal, telling that to Mikako. When he is in a highly perverted state, he often thinks of "wise" words his grandpa had told him long ago, words of high pervertism. He has his moments of wisdom, especially when in trouble regarding the Angeloids. He is often soft and caring towards Ikaros and Nymph (and Astraea in the manga). He came up with Tomoko just to get with Sohara and Mikako in hotsprings, so he could peek on them. Saki Fujita and Alison Viktorin voice his female counterpart "Tomoko".